20522 BROW116.jpg 500X638\BROW116.jpg 20435 BROW116_1.jpg 500X638\BROW116_1.jpg 20514 BROW116_3.jpg 500X638\BROW116_3.jpg 20515 BROW116_4.jpg 500X638\BROW116_4.jpg Send A Hint! 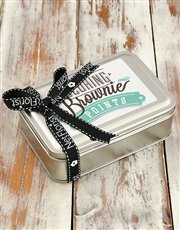 Product Description: less text Spoil a sweet-toothed loved one or friend with a taste of delicious brownies with a twist. 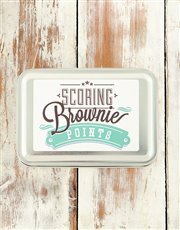 This Sweet Tooth Brownie Tin is filled with new brownie flavours like Cinnamon Sugar, Tipsy Tart and Shortbread. 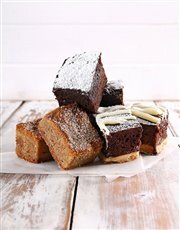 Any loved one or friend would love receiving this scrumptious treat for any occasion. Allergens: wheat, gluten, sugar, eggs, dairy, tree nuts, All our products are Halaal. 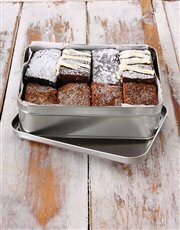 Get this Sweet Tooth Brownie Tin delivered with NetFlorist.